Core–shell nanoparticles coated with carbon have been synthesized in a single chamber using a continuous and entirely low-pressure plasma-based process. Nanoparticles are formed in an argon plasma using iron pentacarbonyl Fe(CO)5 as a precursor. These particles are trapped in a pure argon plasma by shutting off the precursor and then coated with carbon by passing acetylene along with argon as the main background gas. Characterization of the particles was carried out using TEM for morphology, XPS for elemental composition and PPMS for magnetic properties. Iron nanoparticles obtained were a mixture of FeO and Fe3O4. TEM analysis shows an average size of 7–14 nm for uncoated particles and 15–24 nm for coated particles. 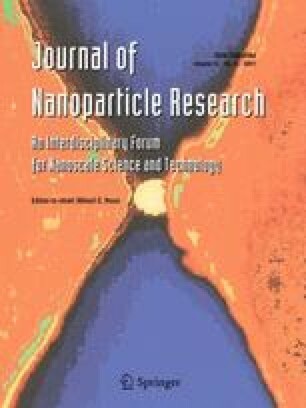 The effect of the carbon coating on magnetic properties of the nanoparticles is studied in detail. This study has been supported by Department of Science and Technology (DST), Govt. of India (project no. 06-DS-002). The authors would like to acknowledge Sophisticated Analytical Instrument Facility, IIT Bombay, Central Surface Analytical Facility (ESCA) and PPMS Laboratory, Department of Physics, IIT Bombay, for characterization of samples. The authors would also like to thank Prof. Mathur from the Department of Chemistry, IIT Bombay, for providing us with Iron Pentacarbonyl and Prof. K. G. Suresh for the discussion on magnetic properties. The authors also would like to thank Prof. P.S. Gandhi for allowing access to the clean room facility of the Suman Mashruwala MicroEngineering Laboratory (Department of Mechanical Engineering, IIT Bombay).